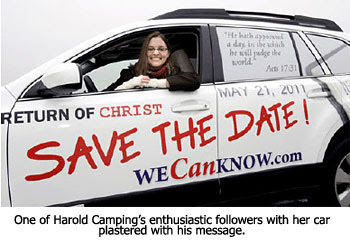 Despite the fact that he was proved to be a false prophet in 1994, Camping has convinced many people of the validity of his new date. His followers have erected billboards all over the nation. Some have emblazoned their cars with the message. Others are handing out T-shirts and bumper stickers. A website has been created at http://www.wecanknow.com/. And mission groups are carrying the message to the four corners of the earth. In the King James Version that passage reads: "And he [a saint or holy one] said unto me, 'Unto 2,300 days, then shall the sanctuary be cleansed.'" This is a prophecy about the desecration of the Temple by Antiochus Epiphanes and its ultimate cleansing. 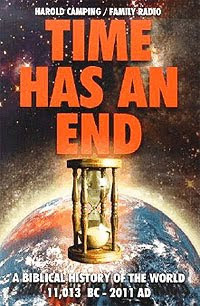 But Miller applied it to the end times and converted the days into years. Assuming the prophecy was given in 457 BC, he calculated that Jesus would return 2,300 years later, on March 21, 1844. Incredibly, he interpreted the "cleansing of the sanctuary" to refer to the purging of the earth by fire at the Second Coming of Jesus! Having justified his first error in date-setting, Camping then proceeded to set his second date for May 21, 2011. 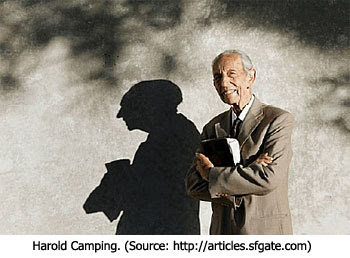 In the next part of this series examining the madness of Harold Camping's date-setting, we'll look at Camping's method of biblical interpretation. 3. For more information about William Miller see "William Miller: The Sincerely Deceived Prophet" by Dr. David R. Reagan, Lamplighter magazine, November-December 2003, pages 10-12. 5. For a detailed discussion of the founding of the Seventh Day Adventists, see "The Seventh Day Adventists: Christian or Cultic?" by Dr. David R. Reagan, Lamplighter magazine, July-August, 2006, pages 3-11. I am so thankful for the Lamb and Lion Ministry. Thank you. I hope we're Raptured out of here before that date! Thank you so much Dr. Reagan. This false date setting will make up for us still being here when the 'date' arrives, and goes - again. Although I won't laugh at them because there are going to be a lot of very confused people wandering about wondering??? Harold Camping will hopefully be de-frocked and driven out of their lives for good - silly man, he should know better at his age. AMEN, AMEN AND AMEN! No truer words have ever been spoken! Sad to say that this is par for the course in this present age. Thanks for your series on Mr. Camping. Your website is the first that I have found that really addresses what he saying. May the Lord have mercy on him. Come Lord Jesus! This should not move us to longing to get out of here via rapture etc, but should move us towards repentance from dead works and move us towards hearing daily what the Spirit is wanting us to say and do in the lives of those around us. Jesus showed us the example of how to live... Not by being a good person, but by hearing and obeying. Over and over Jesus went aside to gather strength and get direction. He heard and obeyed. He heard and obeyed even to death. As scripture says: Those who are led by the Spirit of God are the sons of God. This is what the signs of the times should motivate all into... A lifestyle of hearing and obeying. As all things in us and around us begin to shake, we should be throwing of fleshly ideas, thoughts and lifestyles, and move ourselves into sonship as we follow the leading of the Spirit into sonship. May we each move closer to Christ-likeness as we hear what the Spirit is saying and obey. Since Harold is 100% sure of this, he should give away all his money. After all, he will have no use for it after May 21. I wonder if he will repent and admit to being a false prophet on the 22nd... Nah.... he will say that God changed His mind, to give more people time to get right with God. Or say he made a slight math miscalculation. Or maybe the Lord will decide to take Harold on the 21st. In any case, we we warned about these false teachers, and should not be afraid of anything they say.